What Is a DD Form 256? The DD Form 256 or the Honorable Discharge Certificate is a certificate issued by the Department of Defense (DoD) and other branches of military service to service members with satisfactory military records. Honorable discharge applies to all soldiers whose service has been honest and faithful, with the positive aspects of service and conduct outweighing the negative ones. The form in and of itself is a memorable certificate with all discharge information recorded in the DD Form 214, Certificate of Release or Discharge from Active Duty, issued to service members when they separated from active duty service. How Do I Get a Copy Of My DD Form 256? You will receive a DD Form 256 (Honorable Discharge Certificate) or a DD Form 257 (General Discharge Certificate) when you separate from active duty. Each branch of the service maintains personnel records for about 5-10 years before sending them to the National Archives. Contact the headquarters of your service branch to request your DD 256 or place an order through the eVetRecs System at the National Archives website. When you create and file an online SF Form 180, Request Pertaining to Military Records you will be given a list of forms to choose from. The DD Form 256 is not on that list. You will need to describe your particular case in the comments section and submit the form as usual. What Does A Dd Form 256 Look Like? Are You Considered A Veteran With A Dd Form 256? This certificate has a coat of arms of a specific military institution and contains basic information about the veteran: their name and date of honorable discharge. All legal information pertaining to discharge conditions and benefits eligibility can be found in your copy of the DD Form 214, Certificate of Release or Discharge from Active Duty. The short answer is yes. Title 38 of the Code of Federal Regulations defines a veteran as "a person who served in the active military, naval, or air service and who was discharged or released under conditions other than dishonorable." This means that any individual that completed their service for any branch of armed forces classifies as a veteran as long as they were not dishonorably discharged. That, in turn, means that if a person has a DD 256 certificate, they have successfully completed their service, which makes them a veteran. 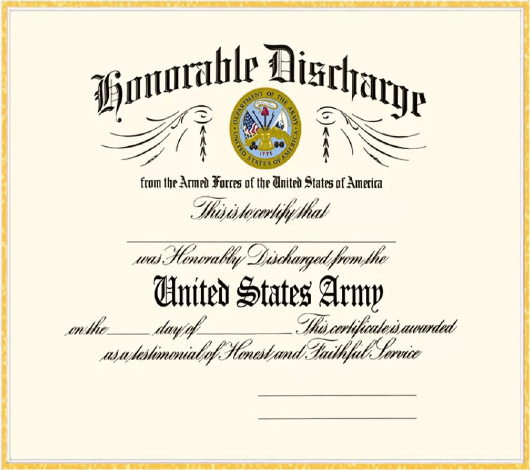 DD Form 257, General Discharge Certificate is granted to people who have successfully completed their military service, but their records are not considered sufficiently distinguished to warrant an honorable discharge. This form is a certificate handed out along with a copy of DD Form 214, Certificate of Release or Discharge from Active Duty that describes the soldier's service in full. DD Form 214, Certificate of Release or Discharge from Active Duty is a document that serves as a certification for past active duty. It contains information about time spent in service, military awards, education, assignments, enrollment and discharge dates, the reason for leaving and discharge characterization. This form can be attached to a civilian job application or used to get your VA benefits. Form DD 214 is more important than any of the certificates, as it contains most of the information about a veterans military service. DD Form 215, Correction to DD Form 214, Certificate of Release or Discharge from Active Duty is used for correcting any mistakes found on the DD 214. Accurate discharge documentation is critical in assisting veterans and their family members in establishing eligibility for any compensations, healthcare, home loans, education, and tax benefits. Use DD Form 149, Application for Correction of Military Record to correct your military records and obtain a copy of the DD Form 215. SF Form 180, Request Pertaining to Military Records is a form generated by the eVetRecs System at the National Archives website. It serves as a requesting document for restoring any lost military-related paperwork. NGB Form 22 and NGB Form 22A serve the same purpose as DD Form 214 and DD Form 215, but for Army and Air National Guard servicemen. NGB Form 22, the National Guard Discharge Document contains information about the time served and the nature of the discharge along with other critical information a recruiter would need to process your enlistment. The National Guard belongs to individual states, not the federal government, so there is no central records archive. Contact your National Guard Adjutant General's Office to request a replacement for any lost paperwork.